Mother and daughter team, Sue and Kirsty Lovell are excited to announce the launch of their first digital children’s book, “Tickle Stomp!” This release is the 1st of a hopeful many educational and interactive tales and games for children by Turn It 2 Learn It. Turn It 2 Learn It, child education and entertainment company, officially launches their long awaited digital debut, “Tickle Stomp!” for the iPad. 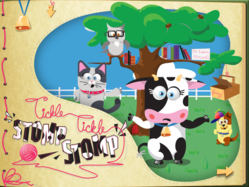 Mother and daughter team, Sue and Kirsty Lovell are excited to announce the launch of their first digital children’s book, “Tickle Stomp!” This release is the 1st of a hopeful many educational and interactive tales and games for children by Turn It 2 Learn It. The iPad application will offer an educational alternative to the many games available on mobile devices for children. “Our goal is to bring strength back to the education system while supporting the value and morals of young individuals as they grow.” Turn It 2 Learn It will take children though an interactive story book, with or without narration, adapting to the child’s reading abilities as they progress. “Turn It 2 Learn It hopes to inspire and ignite the joy of learning that Kirsty and I experienced in her childhood” says cofounder and mother, Sue Lovell. Turn It 2 Learn It’s iPad app release will introduce a motley cast of loveable characters know as the Turner Crew, charged with the task of solving the mystery of Miss Moo’s Missing Moo in “Tickle Stomp!”. Your child will read along with the Turner Crew throughout the story, enhancing their reading and learning skills as they go. Turn It 2 Learn It creates a fun and educational atmosphere maintaining age-appropriate lessons and content. With growing pressures to reshape education structures, Turn It 2 Learn It has an answer: elevating the importance of early learning to a higher level with one-on-one interactive engagement that is not offered in traditional large classroom environments. Once more, children will learn to listen and read aloud with the story, imperative skills for higher learning and cognitive skills. Combined with team and character building exercises, Turn It 2 Learn It plans to improve on more than just reading skills. “Tickle Stomp!” accomplishes an array of goals for education. One additional benefit is the safe introduction to the technology itself. Mobile games and social media have clearly trumped education in the exploding market of mobile applications. Turn It 2 Learn It is a safe way to expose your child to the educational advantages that are many times overlooked in the usage of new technologies. Marrying education with entertainment for young learners will prove a successful combination for better first-time usages of technology. Also to be released alongside Turn It 2 Learn It’s “Tickle Stomp!” is the Miss Moo Turner. The Turner is a finger puppet in the exact likeness of main story character, Miss Moo. What makes this finger puppet so unique is its ability to be used with the digital book to literally turn the page. Made with a conductive fabric, the Miss Moo Turner can be worn by child or parent to even further capture the attention and imagination of the young reader. Having the Miss Moo character as a tangible / wearable item and toy keeps reading fresh in the minds of children, creating a connection between the puppet, reading and learning. The rest of the Turner Crew characters are on deck to be released as well, says the Turn It 2 Learn It team.